Biobloom's Natural Baby Moisturizing Lotion is made of Cocoa Butter, Jojoba Oil & Liquorice extracts. 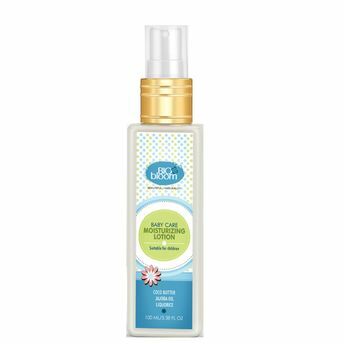 This Paraben Free, Fragrance moisturizer is a natural skin conditioner that provides the required oil to the skin and repairs damaged skin if any. Use this gentle lotion anytime to nourish your baby's dry skin. It absorbs quickly and is mild for your baby's skin. Enriched with the goodness of Cocoa Butter, Jojoba Oil & Liquorice. Explore the entire range of Creams, Lotions & Oils available on Nykaa. Shop more Biobloom products here.You can browse through the complete world of Biobloom Creams, Lotions & Oils .